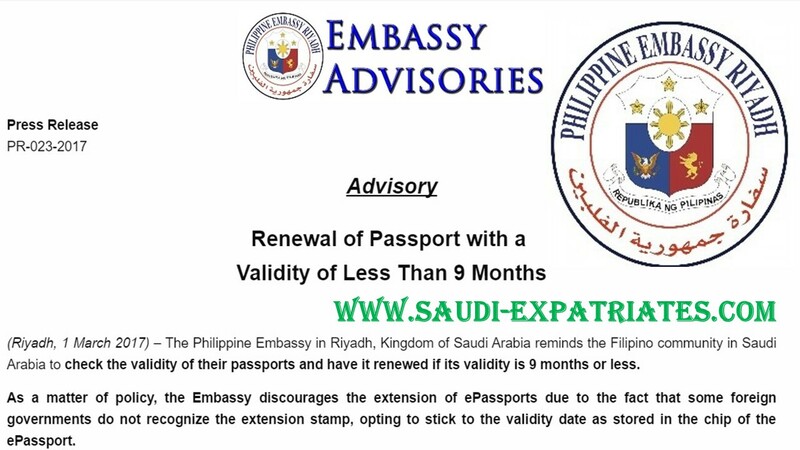 The Philippine Embassy in Riyadh, Saudi Arabia issued an advisory note on 1st March 2017, asking all the Filipinos living in KSA to renew their passport, if the validity of their passport is 9 months or less than nine months. (Riyadh, 1 March 2017) – The Philippine Embassy in Riyadh, Kingdom of Saudi Arabia reminds the Filipino community in Saudi Arabia to check the validity of their passports and have it renewed if its validity is 9 months or less. As a matter of policy, the Embassy discourages the extension of e-Passports due to the fact that some foreign governments do not recognize the extension stamp, opting to stick to the validity date as stored in the chip of the e-Passport. To avoid any inconvenience, Filipinos in Saudi Arabia who wish to renew their passports should obtain an appointment by accessing the Embassy’s official website at, www.riyadhpe.dfa.gov.ph .